The shown pathway starts with pyruvate and results in isobutanol. We also start with pyruvate which is generated from 3-phosphogylcerate in the glycolysis of the cell. 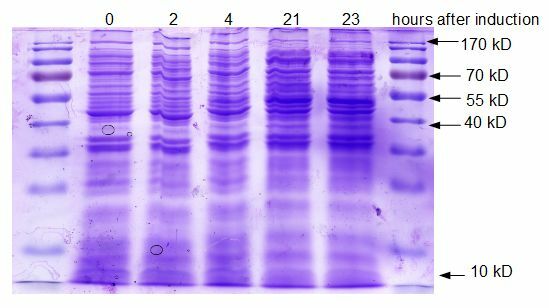 For characterization we analyzed the protein expression of BBa_K1465302 under the control of T7 promoter we made a cultivation of E. coli KRX with the constructs. Samples of E. coli KRX with our construct pSB1A2_T7_alsS_ilvC_ilvD_kivD were taken. Protein expression was induced with rhamnose when the culture reached a OD600 of 0.8. The first sample was taken right before the induction. Additionally we took samples two, four, 21 and 23 hours later. With these samples, we made a SDS Page. Figure 1 shows the picture of this SDS Page. 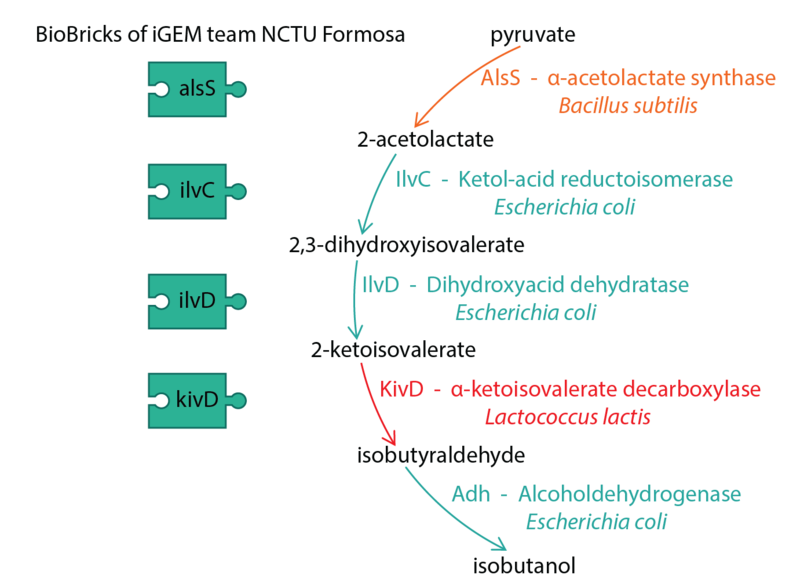 Figure 1: SDS page from pSB1A2_T7_alsS_ilvC_ilvD_kivD. Several bands seem to increase in their size over the time of sampling. One band at a mass of ~ 68 kD shows a significant difference between the sample of sampling right before the induction and 23 hours later. This could be an hint of the overexpression of protein IlvD (65,532 Da). As the proteins AlsS (62,004 Da) and KivD (60,947 Da) have almost the same mass one will not see a difference between the band of the proteins in the SDS Page. Right under the band at a mass of ~ 68 kD is an additional band at a mass of ~ 60 kD visible which size increases over the time of sampling, too. This could be an indication for the two proteins AlsS and KivD. Furthermore there is a band increasing over time at a mass of ~ 53 kD apparent. This could be possible the overexpressed protein IlvC (54,069 Da). These observations fit to our expectations of possible results of this experiment, because all proteins seem to be overexpressed.